You are here: Home / Fun Activities For Kids (By Age) / Activities For Elementary School Kids / Painting with Bugs, literally! I think this was one of my kids favorite activities so far. We went outside to one of our flower pots by the pool where we can easily find bugs, frogs, geckos, etc. gathered a couple worms, grubs, a beetle and an earwig. Going on a bug hunt was fun! 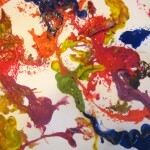 Then we dipped them in paint and watched them move. Tweezers, paint covered bugs are slippery! 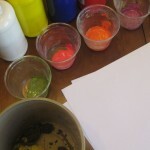 Different colors of water soluble paint – so the bugs can live through this experience. What to do: drop an insect into paint, drop them on the paper and repeat with different bugs and colors. Make predictions about which bugs would be the fastest. Were they? We predicted that the beetle would be the fastest. The paint, however, made the beetle really sluggish while the worms, if they were really wet, would move very fast across the paper. As they dried a bit they slowed down considerably. Make a graph of the fastest bugs and their accomplishments, chart the fastest and the slowest bugs. Does the bugs speed change if you mix the paint with water or with oil? Dip a bug in blue paint and drop it where there previously was a red or yellow bug trail, does the new bug’s squirming introduce new colors by mixing the paints? How do the various bugs move? What does a worm do to move compared to a grub or a beetle? Can you see the foot prints of the bugs? What does the bug do when touched? Does it curl up into a ball? Does it bunch itself up? Does it run? Does it freeze? How are bugs different from animals? people? cars? Hope you enjoy exploring with paint and bugs! Thanks for linking this up to the Homeschool Highlight Reel at Work & Play, Day by Day! I have never been over to your site before and it seems you have lots to offer. I will be back soon to visit again! Sorry if this is a repeat! I thought I posted it, but I’m not sure so I’m reposting! Thank you for linking this project up to the Homeschool Highlight Reel at Work and Play Day by Day! It looks like I will be back to see more, you have a beautiful site here with many useful ideas. I hope you will participate again, I am sure many of my readers would be interested to see your sight! Wow. You are a lot braver than I am. I don’t do bugs 🙂 Cute idea though! Bug painting is such an awesome idea!! My kids are gonna LOVE doing this! How did you think of it? So fun..
Why would you encourage your children to torture animals, even if they’re “just” bugs?! That’s just mean. If you want to do this, use mud instead of paint. Some good sticky mud would be fun for artwork and would’t be setting such a bad example to your kids.